We hosted a holiday dinner with 'Pour Boy' wine buddy Dr Dan and Linda, neighbors Mark and Shirley and colleague Rick and wife Debbie. Linda prepared her classic beef tenderloin with scalloped potatoes and haricot verts and a dinner salad and fresh baked bread. We were joined later with Sean and Michelle. Dan brought this one of a kind Special Barrel Selection 25th Anniversary release Cabernet Sauvignon from Saddleback Cellars aptly named 'Nils' for founder, patriarch and Napa winemaker legend Nils Venge. 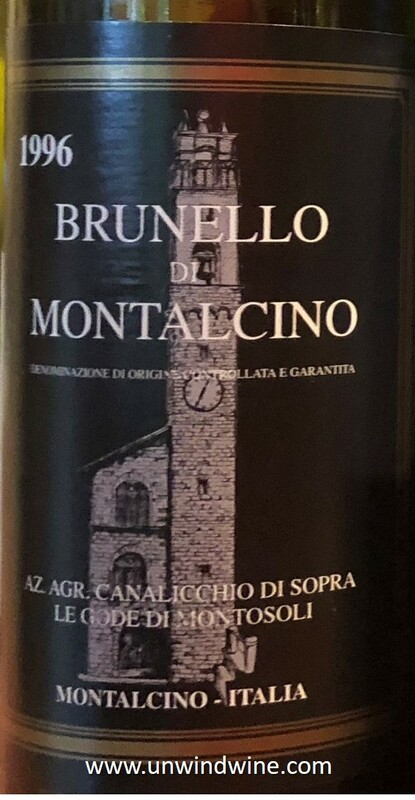 He also brought a 1996 vintage Brunello Montalcino. Ironically I had just been down in the cellar seaching for tonight's dinner wines and came across and considered a 1996 Saddleback Cellars Oakville Cabernet, essentially the same wine as the Nils. So, this bottle provided both a vertical (multiple vintages of the same wine) comparison tasting of this label, and a mini-horizontal comparison(multiple wines from the same vintage) tasting of two same aged vintage wines, 1996. 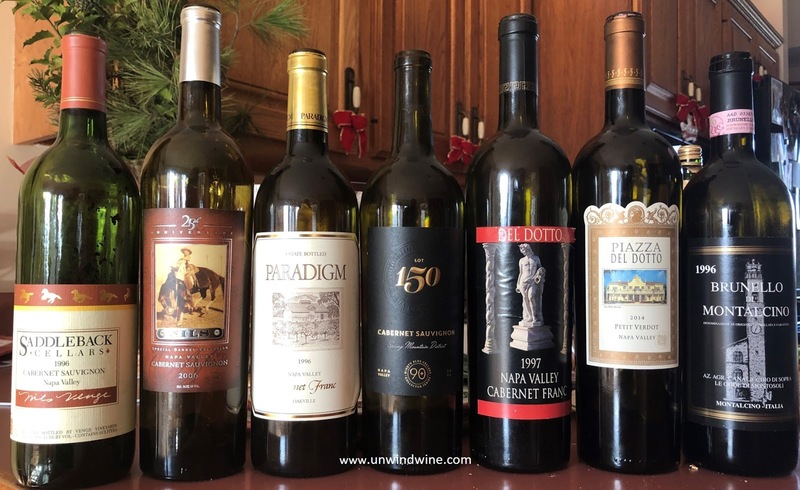 For a further horizontal and near vertical comparison tasting, I also pulled a 1996 release of Paradigm Napa Cabernet, another Oakville appellation wine. 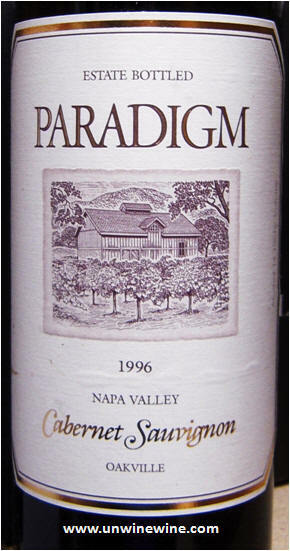 Extending the vertical theme / approach, we later also opened a 2004 release of the Paradigm (albeit a 2006 would've completed the symmetrical comparisons). Rick and Debbie noticed my extensive collection of Del Dotto wines and commented on their memorable visit to the Del Dotto Estate Cellar Tour and Barrel tasting. 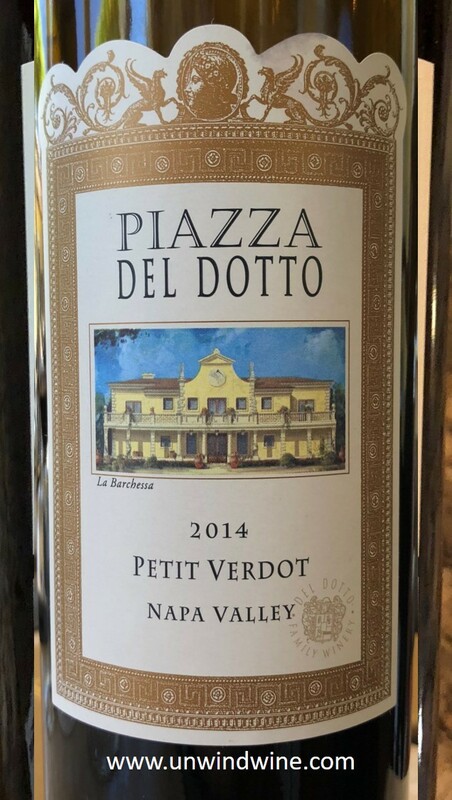 Hence, we pulled a couple of Del Dotto wines to complete our tasting flight for the evening, a vintage 1997 Cabernet Franc, and a Piazza Del Dotto Petit Verdot. For the appetizer course, Mark brought a selection of artisan cheeses and shrimp cocktail hors d'oeuvres, We served a vintage Champagne and pair of Sauvignon Blancs including our favorite, Cliff Lede. Somewhere during our wine talk over dinner the conversation turned to Negociant wines and private labels. Dan and Linda were just returned from Thanksgiving weekend and wine tasting at the Inn at the Biltmore Estate in North Carolina. They talked of their two million bottle wine sales, the majority sourced from Northern California fruit and juice. I pulled a Ninety+ Cellars Lot 150 Cabernet Sauvignon as a classic fun example of such wines. More below. This is a vintage Champagne, as opposed to a common NV (non-vintage) blend of several vintages. 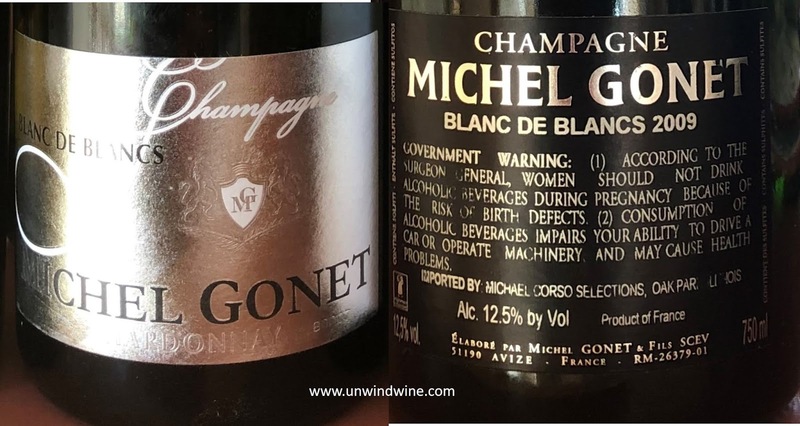 The Michel Gonet family have been producing wine for 7 generations, since 1802. 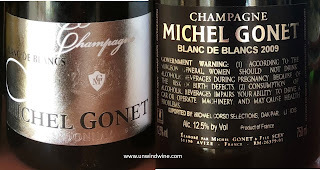 Michel Gonet expanded and improved the winery in 1973. He has since retired and turned winemaking over to daughter Sophie Signolle who manages Champagne production. She is President of Women Winegrowers of Champagne and also "l' Universe du Gout en Champagne." The family owns 40 hectares (about 80 acres) of vineyards stretching south from the city of Epernay on the Côte des Blancs, part of which is the finest classified Grand Cru vines located in Avize, Mesnil sur Oger and Oger, the most renowned terroirs of Champagne. The vineyards' are of the finest terroir in Champagne with exceptional climate, protected by the mountain of Reims from the cold North winds and rainfalls in the Marne valley. The characteristically chalky sub-soil combines with ideal exposure to the sun. This Blanc de Blanc is composed of Chardonnay which is 80% of Gonet production. The remaining is Pinot Noir used to produce Blanc de Noir Champagne. We visited the area during our Champagne Wine Experience back in 2006. This is the latest release of one my favorite Sauvignon Blancs. Light straw colored, medium-light bodied, harmonious nicely balanced layers of subdued citrus, peach, pear and lychee fruit with a refreshing crisp clean, smooth acidity finish. We first met Nils Venge back in the mid-nineties when he was winemaker for Del Dotto Vineyards and Winery. We visited Nils at the Penny Lane Estate and vineyard back in 2001 when we acquired a selection of Venge Vineyards and Saddleback wines. I was not aware of this label and was delighted that Dan discovered this and acquired some to bring and share for our dinner. This was dark garnet colored, medium-full bodied with full forward black berry and black cherry fruits accented by notes of spice, black tea, leather, and dusty rose with full smooth silky tannins on the finish. To compare with the Nils 2006 special release above, we opened this 1996 Saddleback Oakville Napa Cabernet. Initially a bit tight and closed, we decanted and aerated this bottle and it opened a bit more and reveal its native character and fruits over the course of the next hour. The two Saddleback wines had remarkable similarity, being potentially the same wine but ten years removed. They showed the same basic profile and character but the '96 showed darker blackish garnet with slight hints of gray color, the same fruit profile albeit slightly subdued, accented by the same notes above of smoke, dusty leather, earth and tea. To compare with the '96 Oakville Napa Cab above, we also opened this Paradigm Cabernet from the same appellation and same vintage. This provided an interesting comparison with the other '96 Oakville Cabernet sitting side by side. This wine had the same color and body as above. We also decanted and aerated this bottle which accentuated its bouquet and flavors which emerged further after about thirty minutes. The Paradigm showed fewer aromatics and more subdued fruit than the Saddleback above, but opened a bit more over the next hour. We tasted and acquired this wine during a winery visit back in 1999. "I opened, decanted and then rebottled and recorked this wine an hour before setting out for the restaurant. Upon decanting it released huge aroma's of berry fruits and some floral. After opening for serving the fruit was a bit muted for almost an hour before revealing black berry and hints of sweet black raspberry, giving way to a layer of charcoal, anise and spice. Tannins were moderate on the lingering finish. This wine is still showing okay but should be consumed over the next few years." Dan and Linda spent Thanksgiving weekend visiting the Inn at the Biltmore Estate in North Carolina where they tasted Estate and other private labeled wines. They produce two million bottles per year although only a fraction are from grapes grown locally. The remaining majority are sourced from Northern California fruit and juice. We talked about Ninety+ Cellars who produce a large portfolio of wines, sourced from numerous producers and growners from around the globe. Each label is named with a unique 'Lot' number indicating the source and vintage release. This is done to anonymize the source typically acquired under non-disclosure agreements to maintain their secrecy, since they don't want to be revealed and thereby conflict with their brands. In this particular case, Lot 150 Cabernet Sauvignon, 'sparklers' were acquired, the name given for bottles of wine already filled but not yet labeled. The labels are applied last to avoid them being torn, stained or soiled during storage or shipping. In this case, labels were not yet applied as the wine as sold to a third party private label marketer who applied their own labels accordingly. The issue was that they had already corked the bottles with branded corks identifying the source producer, undermining their quest for secrecy or confidentiality. Only upon opening the wine is the originator source revealed! One of the reasons for seeking anonymity is that often, as in this case, the private label wine is half the price of the original source producer label, providing great QPR (quality price ratio). Dark garnet colored, medium full bodied, firm structured backbone, complex concentrated blackberry and black currant fruits with layers of firm bone dry tannins with notes of oak, spice, hints of dark mocha, anise, leather and dust. Needs a bit more time to settle and not for the feint of heart with the rock hard tannins but if you like that style (which I do) then this is a great find at a good QPR (quality price ratio) value. This is a blend of mostly Cabernet Sauvignon, with Cabernet Franc, Merlot and Petit Verdot aged 22 monthsin French Oak. 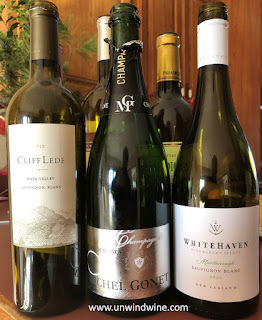 As noted by others, and in my blogpost (url below), and my label/cork picture submission, the source for this wine is Spring Mountain Vineyards. We served this Cabernet Franc to compare against similarly aged Cabernet Sauvignons to contrast the different character of the Bordeaux varietals where Cab Franc is introduced into the Blend for spice, breadth and depth alongside the firmer Cabernet Sauvignon and the softer Merlot. We chose Del Dotto that Rick and Debbie visited during their trip to Napa Valley. This is one of the last remaining bottles we acquired on release back in the late nineties. Consistent with tasting notes from two years ago, "Tonight's tasting was more consistent with notes from a few years ago, dark ruby color, medium to full body, spicy black berry and black currant fruits are still vibrant in this nineteen year old, accented by tones of earthy leather, cedar and tobacco with hints of anise on the smooth tannin finish." 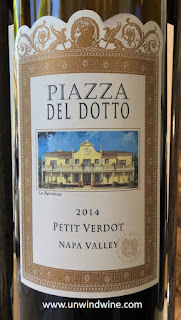 We tasted and acquired this wine as part of the during our Del Dotto Piazza DELICACIES Food and Wine Experience Tasting at the winery during our Napa Wine Experience this summer. Like the Del Dotto Cabernet Franc above, we served this Petit Verdot to compare against similarly aged Cabernet Sauvignons to contrast the different character of the Bordeaux varietals where Petitot Verdot is introduced into the Blend for backbone, structure and color, as well as further breadth and depth, alongside the primary core Cabernet Sauvignon and or softer Merlot. Dark blackish garnet colored, full bodied, nicely balanced, firm forward concentrated black berry and black cherry fruits, with notes of mocha, spice and hints of pepper spice with smooth lingering tannins. 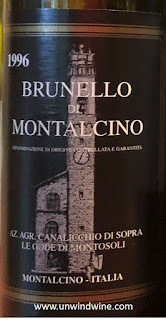 Later Dan and Sean and the girls opened this vintage release '96 Brunello which rounded out our horizontal tasting of that release. Dan brought this to our wine tasting this summer too. This is 100% Sangiovese for very pleasant easy drinking - ideal for food or hearty cheeses. Garnet colored, medium bodied, black berry and black cherry fruits with notes of earth tones, tobacco box and sweet brown spices with a tangy long spicy finish.